November’s coming up fast upon us, and there are a number of ballot measures to be passed or rejected and offices to be filled with elected officials. We all want to be good and informed voters, so, if you’re looking for information on officials and ballot measures available in your state of Kansas or Missouri, read below! Make sure you remember to carve off time on November 4, 2014 to make your voice heard and participate in the voting process! 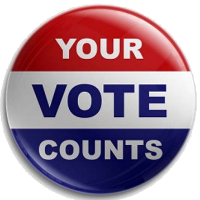 No Comments to "Get Out and Vote – 2014 Edition"